For 1954, IHC introduced the new R-100, which look exactly as the R-110, but cost US$ 60 less, and carry some improvements. including a bit more horsepower, improved gear ratios, larger brakes, more flexible springs. With a 4,200 lbs GVW (4,600 lbs on R-102) riding a 115 in wheelbase, the power come from a Silver Diamond 220 cid (3.6L), in-line 6-cylinder engine with overhead valves, 104 hp and a 7:1 compression ratio (up from 100 hp and 6.5:1 on the R-110), driving a 3-speed transmission and a semi-floating rear axle. 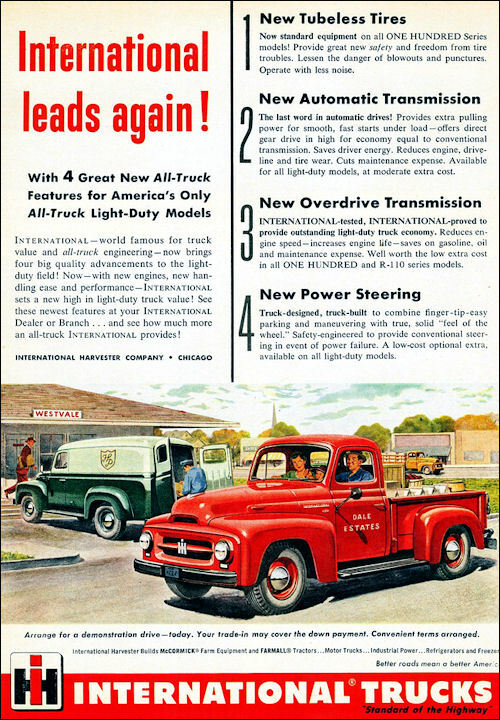 From mid '54 it can also have with an overdrive transmission which provide a 30% reduction in engine speed at 60 miles per hour, or with a torque converter fully automatic transmission (basically a GM sourced 3-speed Hydramatic). Power steering also became an option. Tire size is 6.00x16 6 ply.